Nokia (s nok) today opened its annual Nokia World event in London to 3,000 participants with the introduction of four Symbian smartphones, claiming “Nokia is back!” More striking to me than the new N8, C6, C7 and E7 smartphones was the tone of Nokia’s message during the event kick-off. To call it defensive would be an understatement. With such a rich history of handset development, Nokia is certainly entitled to remind people that “it invented the smartphone,” as Savander adamantly pointed out. But repeating a mantra while competitors innovate quickly won’t solve the problem of Nokia’s profit squeeze. To combat the increased competition in the high-end market, Nokia is leaning on Symbian^3 and the new handsets introduced today. Oddly, Nokia called it the “new Symbian platform” and dropped all references to Symbian^3. 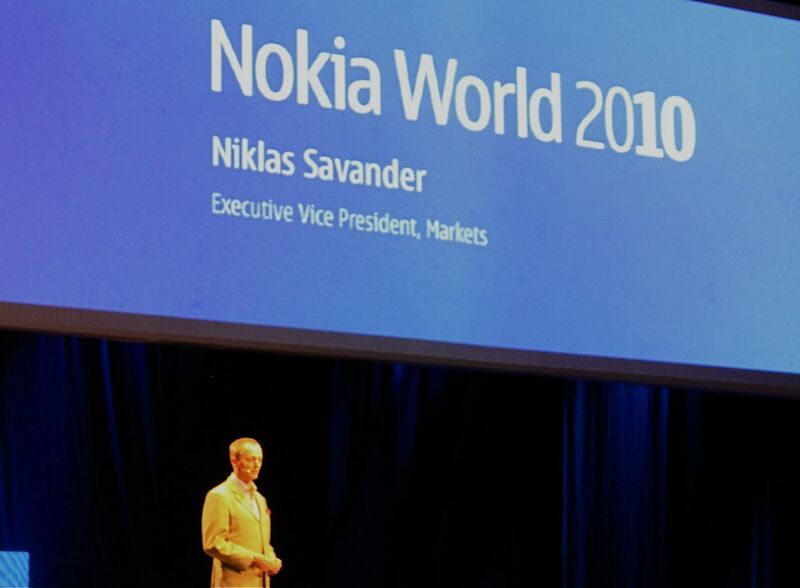 At his last Nokia World event, Vanjoki unveiled the new phones and offered a run-through of features. The N8, introduced earlier this year, is dubbed an “entertainment powerhouse” with the large touchscreen and 12-megapixel camera with its mechanical shutter. In the only actual device demonstration of the morning, Vanjoki impressed the crowd by using an N8 with HDMI cable to show a high-definition movie trailer on the large stage displays. Nokia’s C6 and C7 appear to be general-purpose devices with baseline smartphone features, such as integrated social networking tools, location-based services, email and browsing. More intriguing to those wanting a hardware keyboard is the E7, with a 4-inch touchscreen that hides a full QWERTY keypad. Nokia is positioning the E7 as “the ultimate business smartphone.” It has rich support for Microsoft Exhange (s msft), but is also a device that blends work life with personal use. Missing from the smartphone announcements was MeeGo, the platform Nokia plans to use for the highest-end mobile devices. Vanjoki briefly mentioned that no new MeeGo devices would be announced today, but we’ll hear more about the platform prior to the end of 2010. For now, Nokia is competing with Symbian^3. Just after the keynote, I spent 15 minutes with Vanjoki and pressed him more about MeeGo. “The platform,” he told me, “is the next part of our strategy, following Symbian in the smartphone market.” According to Vanjoki, a reworked Symbian has “caught up” to other platforms, and MeeGo is the product platform that will catch competitors flat-footed. With bluster and confidence, Vanjoki described the next generation of portable computers powered by MeeGo, pointing out that I’ll want to carry a MeeGo device instead of the MacBook I lugged to Nokia World. If that isn’t some attitude, I don’t know what is. Hi Kevin, Is it the end of the road for N900 Maemo based phones?. I think its a wonderful machine, unique in its own way, and I believe it`s innovation in its on own right. It would be really sad if Nokia doesn`t put in more resources in its development as part of smartphone. I hope the Management is clear with the sense of direction. May be, Nokia should introduce another series of phones (with high end specs) which would compete directly with Apple and the lot based on MAEMO Platform. Its good that nokia is following new strategy for pushing out its new smartphone series but it feels like Nokia is just lazing around . With so serious competition already built in the market , isnt it the best time nokia should be out with its wide range of smartphones directly hitting operators and multiple countries . But Nokia still waits for the doom till its dead . What has those pictures anything to do with real N9? Even if it might be some early prototype it does not tell anything of value. You need to remember that this in Nokia HW not Apple. Cool, muy bueno y nokia crece dia a dia. > movie trailer on the large stage displays. About a week ago, Steve Jobs did the same demo, except it was wireless. Nokia has always made excellent high-end hardware. Unfortunately, the Symbian platform has never kept pace. The “we know what’s best” attitude has left critics ignored and preventing Nokia from sufficiently studying their competitors successes, especially in the realms of third-party app development, customer friendly UI’s, and media ecosystems. In the U.S., Nokia has been notably unsuccessful in lining up carrier partners for its high-end smartphones. If I was at the event, I know what I’d be asking. It would have little to with new phones and Meego, just like the future of the company. The specs might not be impressive, but it does look pretty nice. Maybe they’ll nail the internals with the next revision. It’s good to see Nokia still in the game. Smartphones are too new a concept (< 20 years?) to be pared down down to two fun OSes and some business phones. That’s not “attitude,” that’s hubris, and completely unwarranted hubris at that. Hardware is becoming ubiquious. The future wont be about what phone you have it will be about what branded utilities your running. Whats a phone company too do? Brand, Social network, Location Based Services. Meego and Ovi cannot withstand the branding. lbs, social litmus test. Yeah. That’s why Nokia are number 5 on Business Week’s brand list and Apple are number 20. Americans… you just don’t get the rest of the world do you? For instance, when we’re talking about iPhone/iPad, it’s easy to get the two confused because they pretty much do the same thing, except one is bigger and more appropriate for certain tasks (because the phone’s screen is too small) and it doesn’t make phone calls yet. Did you find a similar confusion with Nokia’s marketing statements? Vanjoki said you would want to carry a Meego device instead of the MacBook. It sounds like in perhaps a year they were going to offer all that a Mac OS / Windows 7 laptop can DO in the size of a pad. Did you ask him, or did they say how that was going to be accomplished? Also, given a list of the incredibly long list of things a current smartphone can DO (such as the partial list I provided in the reply of Om’s Superphone of the future article), what did they say, or suggest that their devices were going to DO that was different, innovative, even game changing? Or did they just plan to “turn up the volume” on features that already exist in smartphones, such as adding a mechanical shutter to their 12 Mp camera, or 1080p HDMI output for video? Did you see any of that? It’s unclear from your reporting. Did they split capabilities between their phones to appeal to different audiences, whereas other platforms offer ALL the capabilities in a single phone? What about the problems splitting feature sets causes, or was the N8 a superset of all the others? You are our eyes and ears at the conference. Being part of Om’s team you should already be up on the complexities of the mobile marketplace and be able to see through the hype and hyperbole and challenge assumptions. That’s what I am looking for when I visit GigaOM and I can’t be there but you guy ARE. If I have to subscribe to GigaOM Pro for that kind of information, then please let us know. Otherwise…. “Did you find a similar confusion (to iPhone/iPad) with Nokiaâ€™s marketing statements?” Not so much. Vanjoki spoke more about the devices and said that one device (clearly a shot at Apple) offers compromises in camera, browser and/or keyboard, just to mention a few areas. But at no point, did he hit the target audience for the device – he positioned devices for certain functions (entertainment for N8, business class for E7, etc….) and left it up to us to determine the user type. Perhaps Nokia could be clearer but ironically, offering multiple devices leads to compromise between those devices, i.e. : not all have the great 12 megapixel camera with Carl Zeiss optics like the N8. “Vanjoki said you would want to carry a Meego device instead of the MacBook. It sounds like in perhaps a year they were going to offer all that a Mac OS / Windows 7 laptop can DO in the size of a pad. Did you ask him, or did they say how that was going to be accomplished?” Unfortunately, Vanjoki made this as a final comment and our time was up, so I couldn’t press for details. However, my take is that Nokia plans to redefine the superphone, as it were, with MeeGo. That could be tablets, netbooks or large handsets, but inside will be high-end computing functionality. “what did they say, or suggest that their devices were going to DO that was different, innovative, even game changing?” Actually not much right now, however, they feel the future will be highly dependent on LBS and they touted their Ovi Maps platform as the vehicle for that future. Vanjoki said to me that maps are the lowest level of interface that is understood globally. And maps could actually be the UI of devices in the future. An interesting thought given the Internet of Things and context of activities by location. “Or did they just plan to â€œturn up the volumeâ€ on features that already exist in smartphones, such as adding a mechanical shutter to their 12 Mp camera, or 1080p HDMI output for video?” Again, not too much is being said about future devices or capabilities. I’ve asked various questions along those line to different Nokia people and haven’t been given any clue for future devices. “Did they split capabilities between their phones to appeal to different audiences, whereas other platforms offer ALL the capabilities in a single phone? What about the problems splitting feature sets causes, or was the N8 a superset of all the others?” Based on my conversations up to this point, the company strongly believes that due to its global appeal, it needs to offer a wide variety of handsets with differing functions. Given different cultures, broadband infrastructure and application needs, I see that point, but I also believe that it hurts the “all in one, top-end device” because it will always be limited by its lowest common denominator in the OS. Qt should help address that, however. Hope that provides a little more insight as to what I’ve seen and heard so far! Wow, thanks for a great reply Kevin! Keep those eyes open. I appreciate the challenges any large company has in changing the direction of a huge ship. Nokia’s success makes everyone else better, as well. I hope you’ll see glimpses of them taking some bold moves, but maybe it’s too early with the changing of the guard to play their hand, in addition to the conference being an opportunity to float ideas and get feedback, though you should be able to do that at all times. It sounds like they have to keep serving the meals and keep the entertainment schedule moving along while the guys in the engine room and on the bridge are making the difficult course corrections. Bigger question for me is, why do I want to buy a Symbian phone when I know that platform will be dumped by middle of next year for MeeGo? If MeeGo is going to dust iOS/Android et all, then why not just wait a couple months before laying down the cash for hardware? 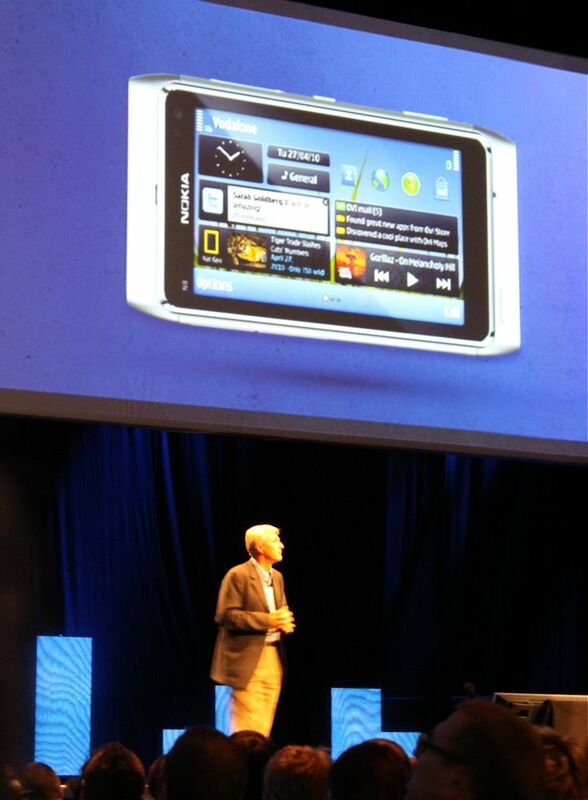 Symbian isn’t going away – it’s the platform that Nokia plans to use in smartphones to combat Apple, Google, etc…. I’m getting the feeling, based on comments heard here, that MeeGo will be targeted more at connected devices with screens larger than a smartphone. I don’t have anything concrete to report and I’m still trying to sort out exactly what that means, but thought it relevant to your comment. I also think that MeeGo will need time to mature, even after the first device(s) arrive. Hopefully, we’ll see soon as the MeeGo Summit is slated for mid-November. It’s like they copy/pasted the design, specs and marketing language from 2008 Android/iPhone announcements. Weird how out of touch with the realities of fiscal year 2011 Nokia is. Wow! Todd is mind reading one of your big skills :-) I was exactly feeling that when I read these specs. I don’t think they have done anything to convince me to get off my Blackberry and switch back to a Nokia. I hope they get this right soon enough. Yes, I have “mind reading” listed as a skill set bullet point over on my LinkedIn page. Om – I think you are missing the point. What Nokia/Symbian has done is put a really fast GPU (a faster part than used in the iPhone 4) and allowed the OS to use it to speed up almost all of the UI flow (60fps is what they’ve quoted). This means that the devices should feel fast and responsive and at the same time be far cheaper than the competition to buy. That’s only half the story though because they do have things like HDMI out and USB OTG to connect external hard drives – specs that I think are pretty killer and not seen on any other devices at this price range. Google says they are activating 200,000 handsets a day (and Apple is in the same range). So Nokia is certainly not selling 30 times the smart phones of Google/Apple, did you mean 30% more? Stan, that’s an error on my part and due to writing during the keynote. Thanks for pointing it out and I’ll get it fixed right way! Once you get an ex Microsoft as CEO, attitude will start showing every where. Need to see if it has some substance!